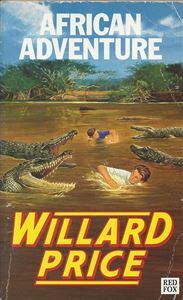 On safari in African big-game country Hal and Roger Hunt are on the trail of a vicious man-eating tiger, accompanied by a puffed-up fraudster, Colonel Bigg. As if that wasn't enough, the boys are themselves being tracked by a merciless band of killers known as the Leopard Society. When Hal and Roger sense their own tracker has been blackmailed into leading them to their deaths, the brothers realize he needs their help. But isn't it rather dangerous to try to help a man who is out to murder you?